More than any other potential GOP presidential candidate, President Obama fears Texas Gov. Rick Perry. That's because Perry is the only one who can devastate virtually any Obama claim. Take the whine we hear most often from the President: That President George W. Bush handed him a terrible economic situation. As USA Today reported June 2: "[White House spokesman Jay] Carney noted that when Obama took office on Jan. 20, 2009, he faced the worst economy since the Great Depression. Obama also inherited the biggest budget deficits in history, from a Republican President—George W. Bush—who had come into office with budget surpluses." A full two and a half years after taking office, Team Obama still blames Bush—for everything except the fall of Adam. Well, there is one other elected chief executive who inherited a Bush economy: Rick Perry, as governor of Texas. And yet I have never once heard Perry whining that the state would be doing so much better if it hadn't been for the policies of his predecessor. To use a football analogy—I mean, we're talking about Texas—it's not who hands you the football and it's not where the ball is handed to you, it's what you do with the ball after you have it. Which brings us to the Obama vs. Perry records on the economy. What has happened to some of the key indicators of economic well-being since Obama has been in charge (roughly January of 2009 to June 2011)? Energy: Gasoline was $1.67 a gallon then. It's now $3.79. Food: Average cost of a gallon of milk was about $2.65. It's about $3.50 today. Housing: The median cost of a home was $229,600. Today it's $217,900. Budget deficit: We fell $438 billion short of balancing the federal budget in 2008. We missed it by $1.4 trillion this year—nearly four times higher. U.S. debt: Total federal debt was $10.7 trillion then. It's $14.5 trillion now—nearly 50% higher. Unemployment: Then, 7.3% of Americans were unemployed and 9.1% are unemployed today. To be fair, not everyone has done poorly under Obama. Federal government employees have made out like bandits. Mercatus Center (George Mason University) economist Veronique de Rugy noted last January that "federal employment has grown by 98,000 employees since the start of the recession." And USA Today reported last year: "Federal civil servants earned average pay and benefits of $123,049 in 2009 while private workers made $61,051 in total compensation, according to the Bureau of Economic Analysis." A recent state-by-state comparison study by the Texas Public Policy Foundation found that Texas had a state tax burden of 8.4%, compared to a U.S. average of 9.7%. And the Texas gross state product grew 94.5% over 10 years, vs. 66.3% for the rest of the country. Texas far outpaces other states in job creation. Michael Cox and Richard Alm, director and writer-in-residence, respectively, at Southern Methodist University's William J. O'Neil Center for Global Markets and Freedom write: "From January 2000 to June 2010 [Perry's tenure], Texas had a net increase of nearly 1.1 million jobs—more than any other state by far. In fact, Texas' outsized gains eclipsed the total of the next five job-creating states: Florida, Arizona, Virginia, Utah and Washington." More importantly, the Bureau of Labor Statistics reported that Texas created 129,000 new jobs in 2009—a recession year. That was more than half of all the jobs created in the country. The Brookings Institution published a study earlier this year looking at job growth in major cities. Texas had five of the top 10 cities, with Austin leading the country in job growth. See why Obama is concerned about a Perry bid? Would you want to stand before the public in a presidential debate and defend Obama's record compared with Perry's? Not being able to defend his own economic record, or attack Perry's, Obama would try to paint Perry in a negative light. That wouldn't be easy. Perry served three terms in the Texas House as a Democrat, and supported Al Gore's 1988 presidential bid. That was when there were still some conservative Democrats. Perry switched to the Republican Party in 1989. 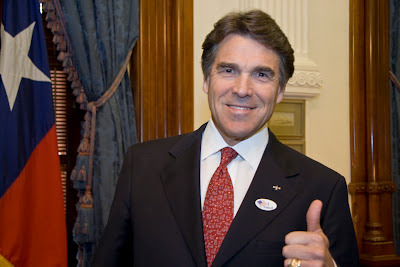 Because Perry is from Texas, Obama would accuse him of being in bed with the oil and gas industry. And yet Perry just signed a law requiring gas drillers to publicize the chemicals they use in "fracking" to extract the gas. As the Wall Street Journal reported on June 20, "Environmental groups said the law doesn't go far enough, but they agreed it was an important step." Obama would also accuse Perry of being out of touch with most Americans. But Cox and Alm of Southern Methodist University's O'Neil Center found in a different study that "Texas led all other states with a net in-migration of 500,000 people from 2004 to 2008." People are voting with their feet and moving to Texas.